DisclaimIt is a server-based message processing tool for adding disclaimers, banners and signatures to e-mail messages. It can be installed and used in an MS Exchange Server 2007/2010/2013/2016/2019 environment. Licenses for DisclaimIt 1.x, 2.x or 3.x are not valid for DisclaimIt 4.8 and must be upgraded to DisclaimIt 4.x licenses. Please look here for more information. Licenses for DisclaimIt 1.x, 2.x, 3.x or 4.x are not valid for DisclaimIt 5.4. 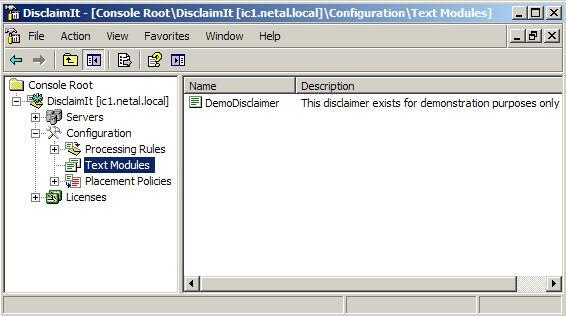 Licenses for DisclaimIt 4.x can be upgraded to DisclaimIt 5.x licenses. Please look here for more information. Multithreaded processing engine which provides excellent performance and high scalability. Supports rule-based message processing for internal, outgoing and incoming messages in an 2007/2010/2013/2016/2019 environment. MS Exchange Server transport rules are used for conditional processing of messages. AD attributes of originators can be dynamically included into the text to be added to messages to implement server-based user signatures. Supports processing of messages being of any body format: rich text, plain text and HTML. Supports attachments to be added to messages. Supports automatically generated vCards to be added to messages. Supports inline image files in HTML text to add. Supports inserting text before the replied or forwarded text of a message. Supports dynamic inclusion of text files and message properties into the text to be added to messages. Supports extensive and configurable trace logging to file or Event Log for diagnostic purposes. Supports optional message logging for diagnostic purposes. Local or remote administration can be performed interactively using the DisclaimIt Manager, which is implemented as an MMC 3.0 Snap-In. Supports easy backup and restore of configuration data. Exposed performance counters allow for monitoring runtime parameters. Documentation (HTML Help) only. This file is included in the product distribution file. You will download this file in case that you want to take a look at the documentation before installing the product. Note: If you download the documentation separately, you must unblock the file after downloading it: Right-click on the downloaded file and select the Properties menu item. Then click on the Unblock button.